If you’re a coffee lover looking for the best cup of coffee you can make at home, you need to do more than buy pre-ground coffee. You need to ground your own. Now hear us out. We’re not saying pre-ground coffee isn’t good, it can be amazing and properly packaged it can stay fresh for a long time. However, nothing quite matches the flavor and quality of fresh ground coffee which is why, if you fancy yourself a coffee connoisseur, you should at least look into buying a best grind and brew coffee maker. What are Grind and Brew Coffee Makers? As the name implies, grind and brew coffee makers go one step above by allowing you to ground your own coffee beans on the same machine you’ll use to brew your coffee. Saving you time, space and money by bringing high quality coffee to the comfort of your home. This will be commonly found in the most affordable models since its design is rather simple. A blade turns in circles quickly, grinding your coffee beans in the process. This leads to two things: inconsistent grinding and a slight change of taste, as the friction created by the spinning blades can heat up the coffee. Burr grinders are slower than blade grinders but that’s because the mechanism works differently. This allows for a consistent grind, both in size and quality, as well for perfectly preserved taste. 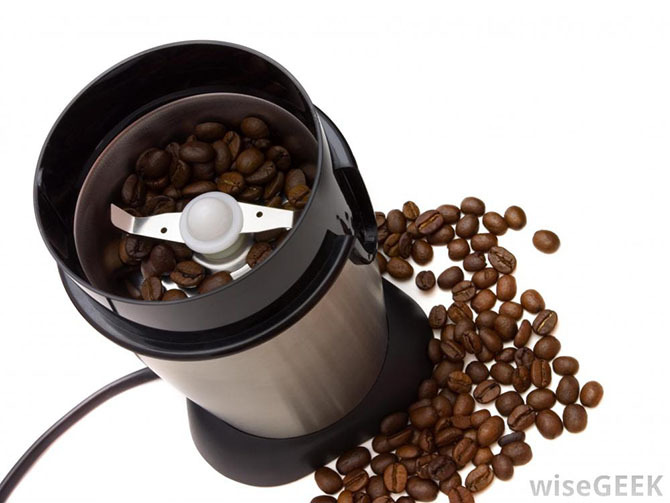 Regardless of what kind of grinder your grind and brew coffee maker has, you’ll find that they both do the same thing. They grind your coffee before you brew it in order to ensure the freshest cup of coffee you can have. Why Use a Grind and Brew Coffee Maker Instead of Pod Coffee Makers? Using pod coffee makers, also known as single serve coffee makers (Think Keuring, Nespresso, Dolce Gusto) involves a lot, and we do mean a lot, of waste. Think about it, every time you make a single coffee cup you’re tossing away one, or even two, plastic or aluminum pods. Pods that aren’t easily recyclable and will end up in a landfill along with other, non-biodegradable things. Sure, they’re convenient and, for the most part, they’re a wonderful way of having high quality coffee at home but is the convenience worth the damage to the environment? Even companies such as Nespresso, which actually make an effort to recycle their used pods, end up creating more and more waste with each coffee cup. A grind and brew coffee maker, on the other hand, reduces waste considerably by letting you grind your own coffee beans. Thus, you not only will stop tossing aluminum or plastic into the trash but you’ll also stop tossing away ground coffee containers. 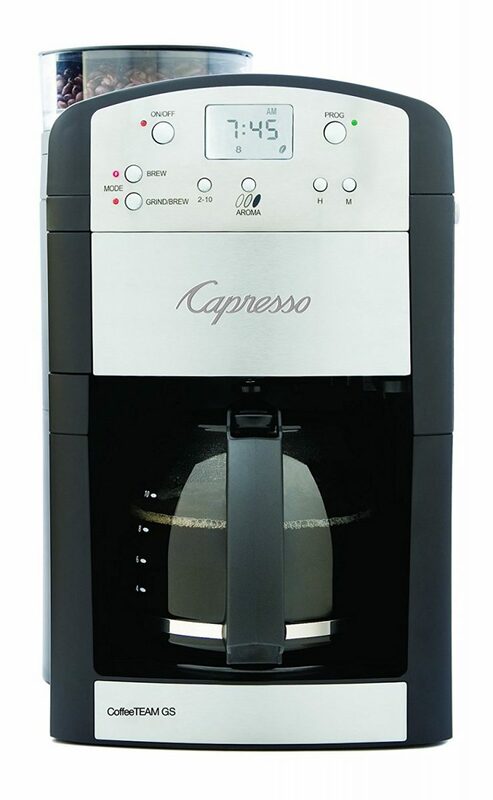 You can find top 10 Best Coffee Grind and Brew Coffee Maker Reviews at HereCoffe. The only real waste? Other than disposable filters, coffee, which is itself biodegradable and can be reused as fertilizer and other goods. Heck, some grind and brew come with their own stainless steel filter, rendering disposable paper ones all but useless. Not only that but the coffee you can brew with grind and brew coffee cups is simply much better, not only because it’s as fresh as it comes but also because most machines let you personalize their settings, ensuring yo​ur coffee is brewed exactly as you like it. This powerful, grind and brew coffee maker is a great choice for those looking to get a perfect cup of coffee. It has five fineness settings for the conical burr grinder so you can adjust for your personal taste. 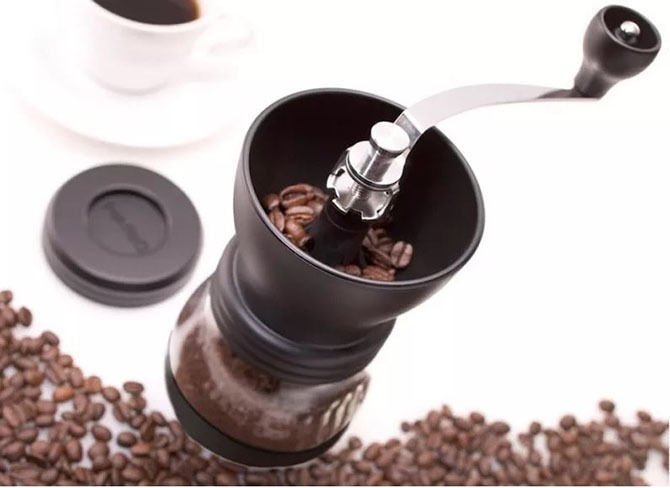 The conical burr grinder keeps the unit compact and allows for 6 ounce bean storage that can brew 20 cups of coffee. 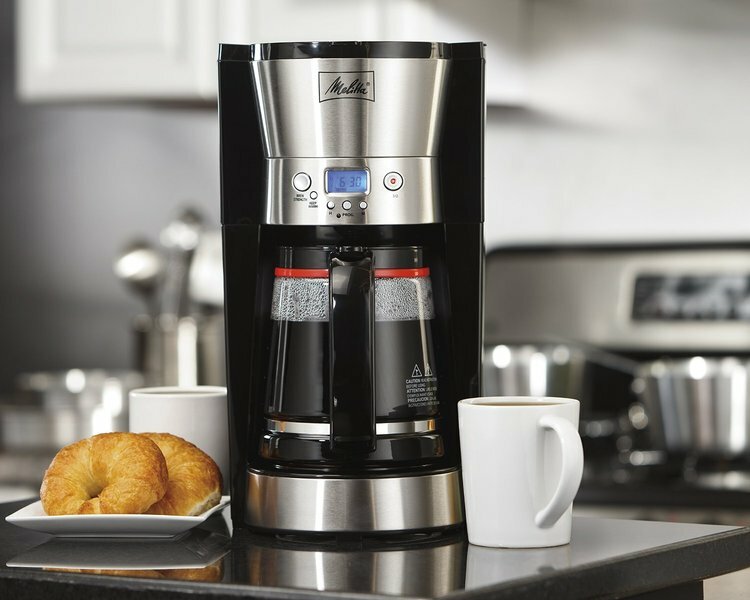 It has programmable settings that will ensure your morning coffee is ready on time and specific to your taste every single time. These settings are easy to use, provided you follow the instruction manuals, and include a pre-ground coffee setting, for those occasions where you simply couldn’t buy whole beans and had to go for the pre-ground ones. This is a small machine that can fit comfortably in most counters and with the powerful grinder sitting on top of the brewer you won’t have any trouble running out of space. Not only that, but the chrome finishes and black accents of this coffee machine ensures it combines almost with every kind of style. As a whole, this grind and brew coffee maker is a fantastic option for those looking for the perfect cup of coffee with minimal effort. The settings for this 10 cup brewer are straightforward enough that you’ll be able to understand them even if you’re not a genius when it comes to technology. Similar to the previous one, both in design and measurements, the DGB 900BC is a grind and brew coffee maker that brews up to 12 cups on a single go. Not only that, but it comes with a thermal carafe that will keep your coffee hot for a while! The best feature of this coffee maker, though, is how much you can personalize it. You can not only program the specific strength of coffee you like but also the time of the day you want your coffee to start grinding. Not only that, but the bean hopper is also programmable, allowing you to store half a pound of coffee beans yet only grinding the number of beans you need for the number of cups you specify. Thus, if you feel like starting your day at 6 am with a strong cup of coffee, you’ll wake up to exactly that. Another excellent feature of this coffee maker, and one coffee snobs are sure to love, is the charcoal water filter included in this machine. That way, you can make sure the water you’re using is as fresh as it comes! Comes with auto off and auto pause and serve functions. Somewhat lengthy instructions that need to be followed to the T.
​Very small letters on the labeling. The path between grinder and basket needs to be cleaned at least once a week to prevent clogging. The maker can only be set up for even cups. This is the perfect small pot coffee maker. 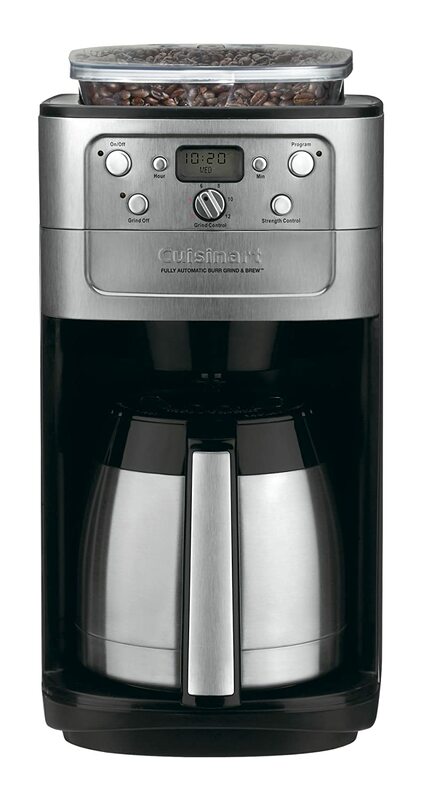 It brews 4 cups at a time so your coffee is always fresh. You can select two different strengths of brew that changes the coarseness of the grounds. Not to mention that it is compact and sleek in appearance. It can also brew ground coffee if you turn the grinder off. The warming plate keeps your coffee hot. It also has a permanent washable filter. This coffee grinder and brewer is the best value, saving you money on wasted extra coffee and disposable filters. The included carafe is glass, so it won’t keep your coffee hot for long, but the coffee tastes so good every time you’ll end going through your pot faster than ever. 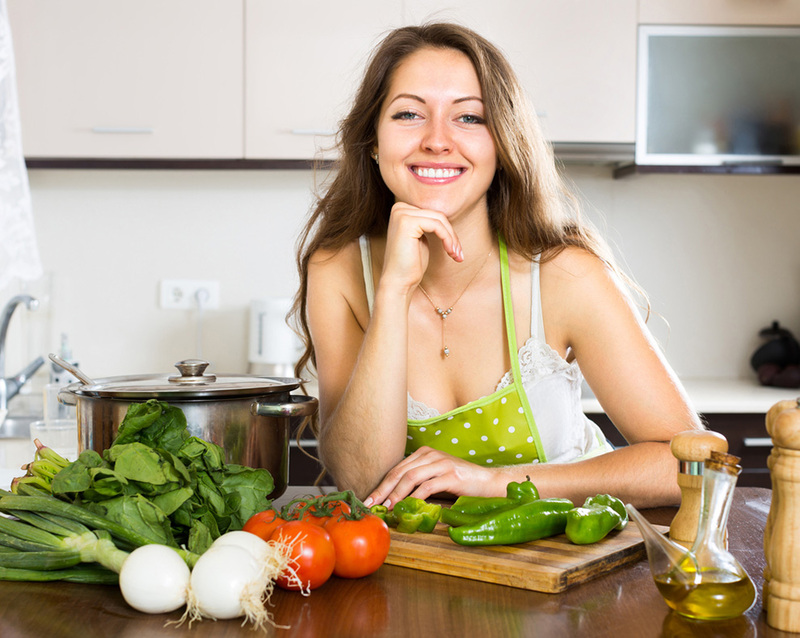 This is the best choice for a small kitchen. 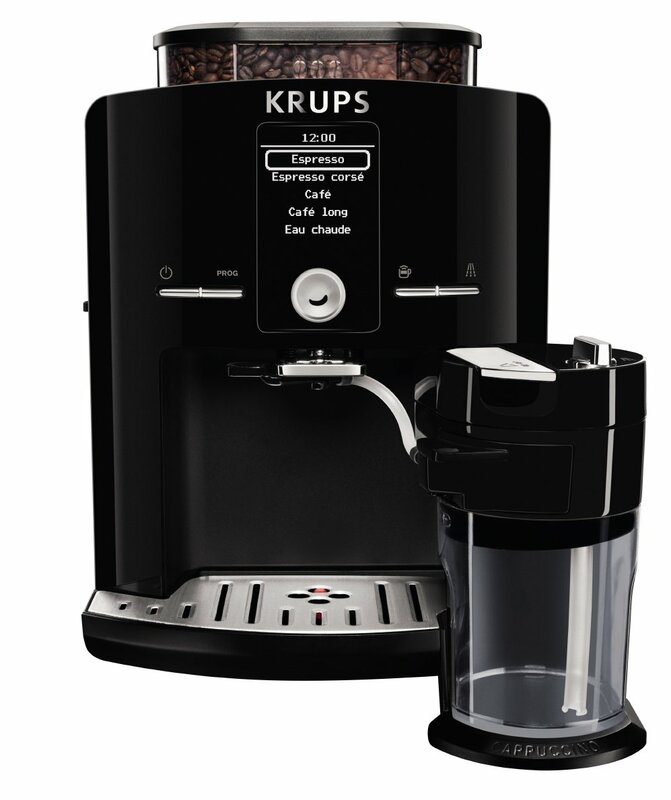 When it comes to coffee makers, Krups is basically a household name and it’s easy to see why. Their coffee makers are always high quality and this one is no exception. This gorgeous coffee maker is not only a grind and brew machine but it can also make cappuccino, making it one of the most complete coffee makers in this list. This machine comes with an automatic grinder that lets you program how and when you want your coffee to be ground. Not only that, but the mechanism is a quiet one so this machine will let you wake up to the smell of a freshly brewed cup of coffee, instead of to the sound of coffee being grinded. The only thing that’s not automatic about this machine is the milk frother, so if you want a delicious cappuccino you’re going to have to work on it, which can take time and some practice. However, if you like black coffee rest assured that you’ll have delicious coffee from the very first moment you use this machine. 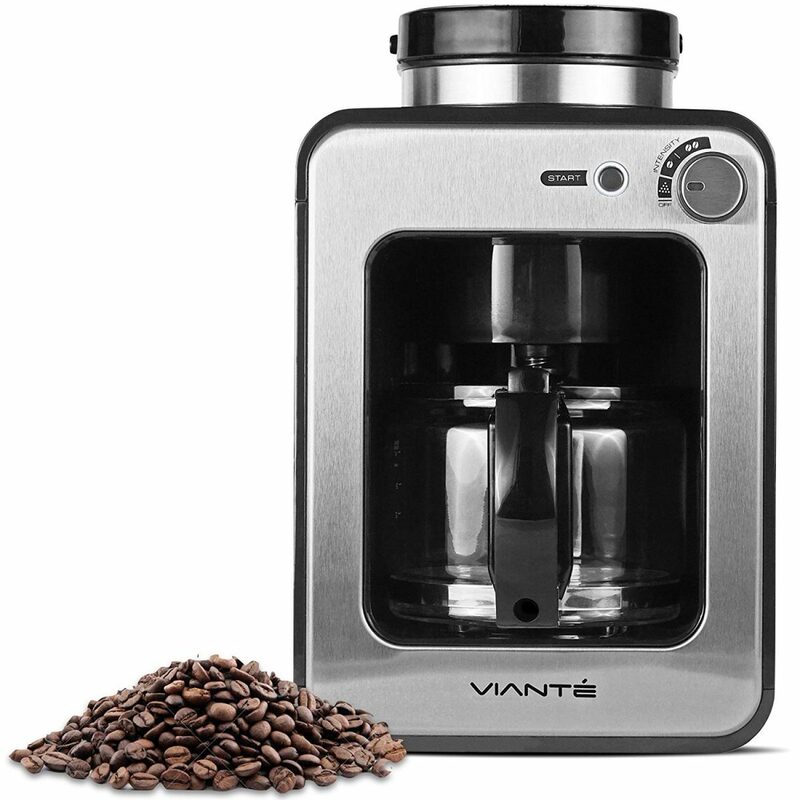 This coffee maker comes with a 60 ounce water tank, so you’ll be able to make plenty of coffee before having to refill it, a large bean hopper and it’s very easy to clean, so you won’t have to waste time every morning by removing and cleaning certain parts. While larger compared to other models, the Krups EA8298 is still quite compact so you’ll be able to place it on your kitchen counter without any trouble. 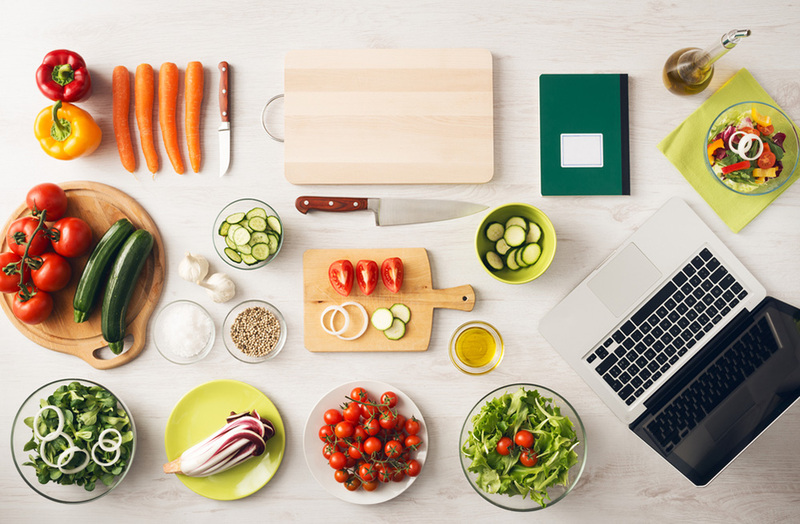 In fact, you’ll be happy to display it in your counter because it looks great! 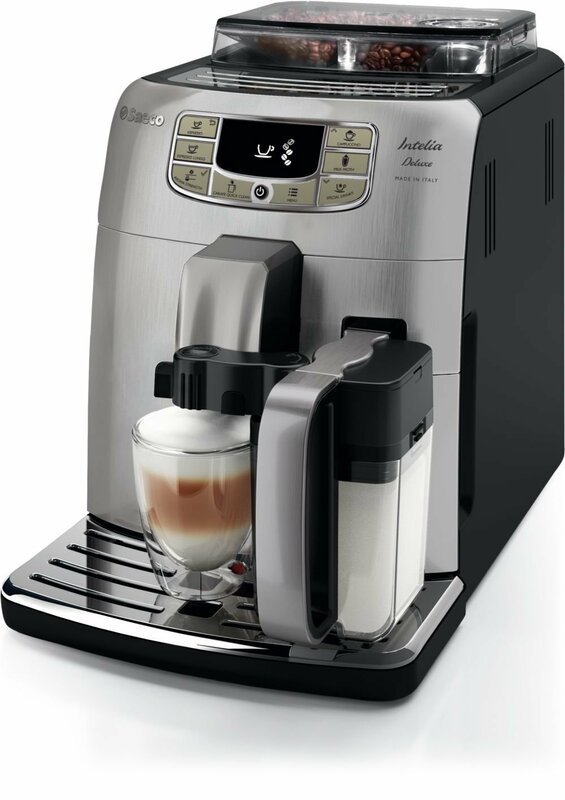 Can make cappuccinos, macchiatos, lattes and more. If the word “intelia” included in the name reminds you of the word “intelligence”, let us tell you it’s no coincidence, as this grind and brew coffee maker is as smart as they come. This is the only item in this list that we’re going to call “completely programmable” because that’s exactly what it is. Not only can you choose at what time it starts grinding and brewing your coffee but you can also choose to turn your espresso into a cappuccino and the machine will do that for you, as the whole milk frothing process is automatic. This machine also allows you to choose not only the coarseness of your grind but also the brew length and even what temperature you want your coffee to be brewed at, which means this machine will soon turn into your personal, at home barista. 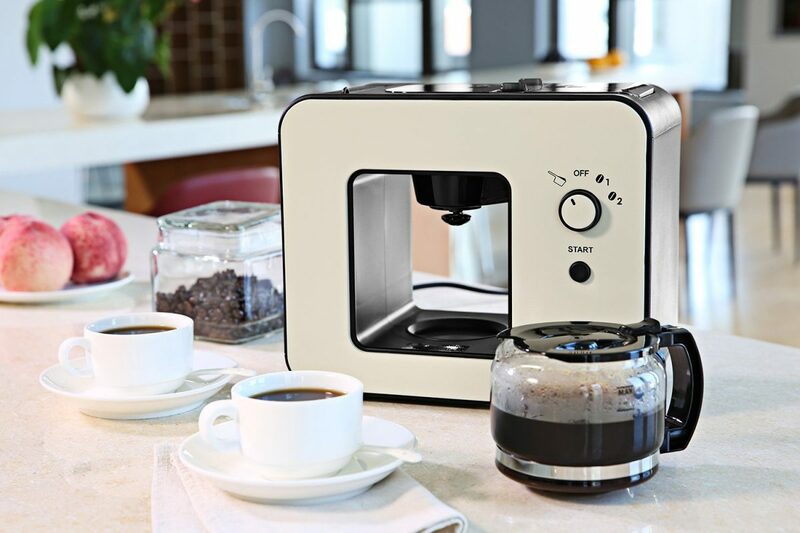 If there’s one downside to this amazing coffee maker is the fact that it only makes one cup at the time, though it does so quickly so you’ll have plenty of time to make a second one or a third before your first one even starts going cold. What's The Best Grind And Brew Coffee Maker? We’ve come to the end of our list of the best grind and brew coffee maker. We hope you enjoyed the read and that we’ve convinced you not only that grind and brew machines are better but that we’ve given you a good idea of which one fits your needs the best! 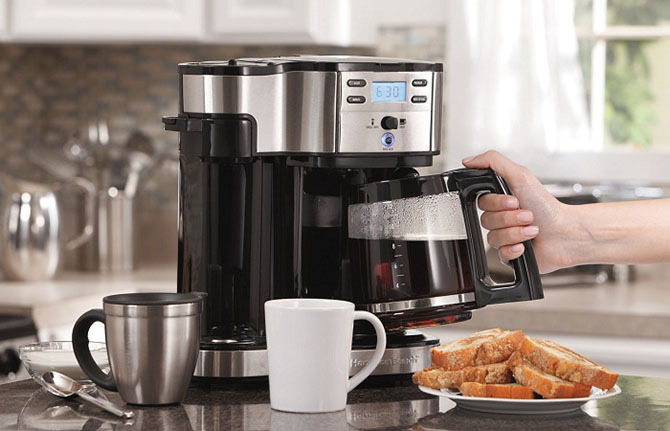 This Coffee maker is very powerful, fast and convenient. What did you think of this review? Did you find the best grind and brew coffee maker for you? Have you tried any of those coffee makers before?